Clingmans Dome is the highest point in Great Smoky Mountains National Park, in the state of Tennessee, and along the Appalachian Trail. Standing 6,643 feet, it is also the third highest peak in the East, only 41 feet lower than the tallest. 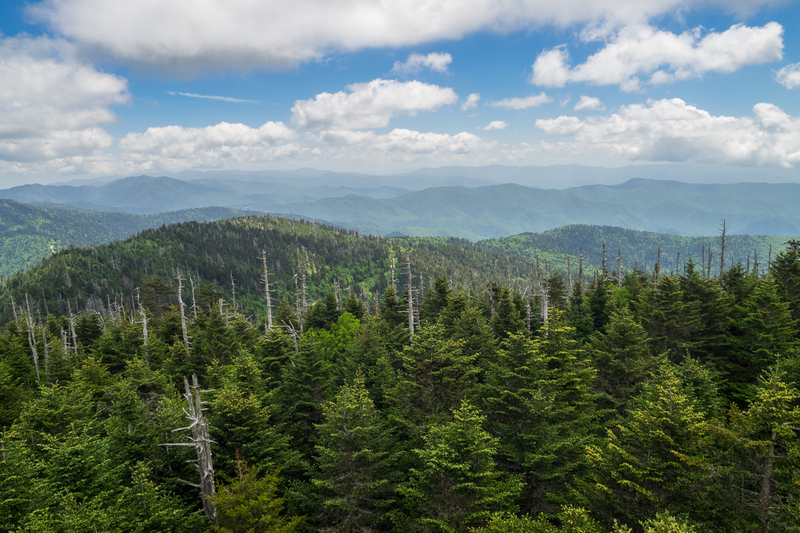 Several hiking trails surround the summit of Clingmans Dome, including the Forney Ridge Trail that heads south to the picturesque Andrews Bald, and the iconic Appalachian Trail that crosses the summit. You can connect these trails at various junctions to make a six-mile hike that straddles the North Carolina/Tennessee state line, and offers a grand overview of the beauty that is the Smokies. Meanderthals visited Clingmans Dome on Monday, June 15, 2015 from 8:00AM to 11:45AM. Our plan was to enjoy the azaleas and rhododendron at Andrews Bald, then take the connector to the Appalachian Trail and the observation tower on the Dome. Hike Configuration: Series of connectors. Blaze: White on AT. Hike Rating: Moderate. Somewhat strenuous from Andrews Bald to the AT. Trail Condition: Very rocky. The national park has done a lot of work with erosion control to make these trails accessible, but they are still quite rocky. Starting Point: Parking area at the end of Clingmans Dome Road. Trail Traffic: We encountered about a dozen other hikers on Forney Ridge, about the same number on the Appalachian Trail, and literally hundreds on Clingmans Dome. Get there early. How to Get There: From Cherokee, NC or Gatlinburg, TN take Newfound Gap Road (Hwy 441) to Clingmans Dome Road near the state line at Newfound Gap. It is seven miles up Clingmans Dome Road to the parking area and trailhead. Directly after turning onto Clingmans Dome Road from Highway 441, there is a one-car pullout on the right. If you would like to see a Civilian Conservation Corps stone tunnel under the road, then stop here. Walk less than a tenth mile up the road and take the footpath down below the level of the road. Voilà! Legend has it that the Appalachian Trail at one time passed through this tunnel. OK. Now you can resume the drive out to the end of Clingmans Dome Road. When visiting Clingmans Dome, no matter the day of the week, I highly recommend you get there early, like 9:00 AM at the absolute latest. We arrived about 7:45, and there were already 20 cars parked there. When we finished our hike at 11:45, all of the 100 available parking spaces were full, and the cars were lined up waiting for someone to leave. It gets very popular in a hurry. The trailhead is at the north end of the parking lot, just past the large signboard. You can take the paved path straight up to the summit of Clingmans Dome, but we were headed to Andrews Bald first. So we headed down the dirt and gravel Forney Ridge Trail on the left. You are immediately met with a series of water bars constructed to help prevent erosion on this fragile hillside. These water bars will be with you for the entire descent. After 0.2 mile you will come to a trail junction. Turn left for Andrews Bald, or turn right for the Appalachian Trail. We started out left, but would return the other direction later. Soon you enter the dark and mysterious elfinwood forest as you descend 550 feet in the next mile. The trail is quite rocky here, so watch your step. Keep your eye out too for wildlife, and for the occasional view through the forest of the surrounding Smoky Mountains. Krummholz, also known as elfinwood, is a particular feature of subarctic and subalpine tree line landscape. Continual exposure to fierce, freezing winds causes vegetation to become stunted and deformed. Under these conditions, trees can only survive where they are sheltered by rock formations or snow cover. Common trees showing krumholtz formation include various species of spruce, fir, and pine. Instances of krumholtz are found in the northern Canadian boreal forests, and surprisingly in the high country forests of the Smokies and Blue Ridge in Western North Carolina and Eastern Tennessee. You will reach the low point of this hike at the junction with the Forney Creek Trail. On a previous visit to this area, we hiked down to the Forney Creek Cascade, but to continue to Andrews Bald, go straight ahead. The next three-quarters mile is a roller coaster, going up and back down, then up once again. Lots of moisture from the near-constant cloud inversions falls on this area, so the park service has constructed boardwalks to help with mud and erosion control. When you arrive at Andrews Bald, you will know it. The trail pops out into the open of a large meadow that overlooks the southern, eastern, and western slopes below Clingmans Dome. On a clear day like we enjoyed, you can also see Fontana Lake far below from this vantage point. However, the primary reason for coming to Andrews Bald in mid-June is the heath shrubs. Catawba rhododendron and flame azalea dominate the grassy bald, and blueberries are just beginning to take flower. The bright orange azaleas were putting on quite a show, but the rhododendron was surprisingly missing. On some plants the blossoms had already come and gone, likely knocked down by heavy rain that pelts this area frequently. On others, there were a few buds of those still waiting to bloom, so it was difficult to say if we were too late, or too early. I have noticed in general that this just seemed to be a bad year for catawba rhododendron. It happens. We met a happy family from Michigan, a dad and his two teenage daughters, and chatted for awhile about the Great Smoky Mountains. They travel quite a bit throughout the United States, and had been quite impressed during their week in the Southern Appalachians. They told us how lucky we were to live nearby. I agreed. After lots of picture taking and a snack, it was time to continue the next phase of our adventure, so back we went the way we came. Pace yourself on the return. It isn’t particularly steep, but you will be climbing pretty much the entire way. We went back past the Forney Creek junction, and then when we reached the first trail junction, we continued straight ahead on the A.T. connector rather than going back to the parking lot. This half mile stretch hasn’t received as much love from the trail building crews as the way to Andrews Bald. You will notice the absence of the water bars as you contend with the very rocky and rooty pathway. It remains uphill all the way, so by the time you reach the A.T., you will have climbed continuously for a mile and a half. A good workout to be sure. When you reach the junction, however, it will all seem worth it when you are presented with the magnificent view of Mt. LeConte seen at the top of this post. At this meeting with the Appalachian Trail you have a choice. Turn right (northbound) to go the 0.3 mile to the summit of Clingmans Dome, or turn left (southbound) to cross Mt. Buckley and begin a steep descent along the state line. We explored some of the southbound direction, keeping our mind on the pitch of the decline. Knowing that every step we went down we would have to come back up, we continued perhaps a quarter mile down the west side of Mt. Buckley, then returned to the junction. Once we started heading to the summit, it suddenly got a lot more crowded. The handful of other hikers turned into dozens, and then — when we reached the paved portion of the trail just a hundred yards from the top — it was a mad house. The observation tower on the summit of Clingmans Dome offers spectacular 360° views of the Smokies and beyond. On clear days views expand over a 100 miles. Clouds, precipitation, and cold temperatures are common at Clingmans Dome. Temperatures at the dome can be 10 -20 degrees cooler than in the surrounding lowlands. Dress in layers and be sure to bring a jacket, even in summer. This is the view to the east from the observation tower. Despite the mass of humanity on the observation tower including crying babies and excited teens shooting selfies with their bff, we enjoyed a few minutes soaking in the surrounding landscape. The massive summit of Mt. Leconte dominates the northern view. Off to the east are Newfound Gap and Mt. Guyot. If you happen to hit it on a rare clear day, you can see all the way to the Black Mountains Range a hundred miles away. To the west are Shuckstack and Gregory Bald among others, with Cades Cove lying in a valley between ridges. Although you can’t see Andrews Bald from the tower, the southerly view is of the area where we had been hiking earlier. We could also see there were scores more people coming up the paved pathway for their chance to peer out into the heart of the Smokies, so it was time to make room for others on the tower. Summarizing, there is a lot more to explore at Clingmans Dome than just the observation tower at the summit. 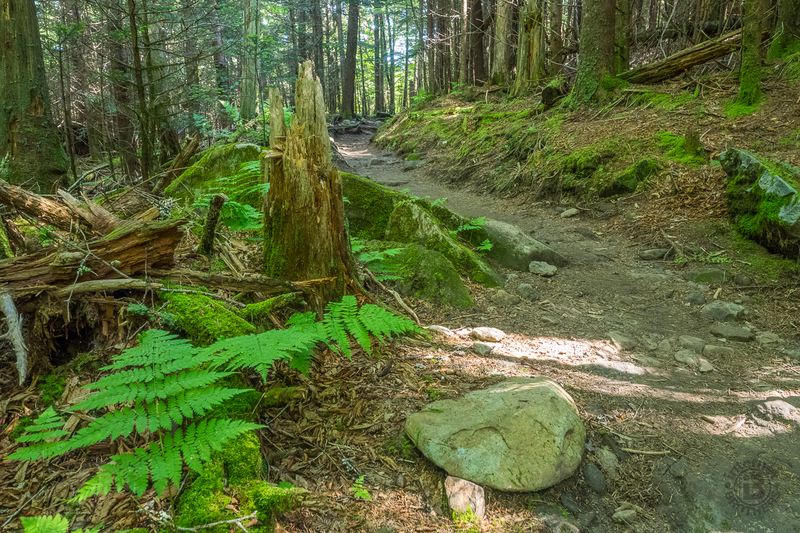 Treat yourself to some time on the Appalachian Trail and/or the Forney Ridge Trail. There are a number of ways to make this hike quite a bit longer if you wish. You can continue down Forney Ridge beneath Andrews Bald. In fact, the trail goes all the way to Fontana Lake, meeting the Noland Creek Trail several miles below. You can go a lot farther southbound on the Appalachian Trail than we did, and you can continue on the Appalachian Trail from the summit of Clingmans Dome northbound to Newfound Gap, and beyond. Keep in mind too, that there are other trailheads along Clingmans Dome Road, including the Noland Creek Trail that traverses nearly 15 miles all the way to Fontana Lake, and Fork Ridge Trail (also part of the Mountains to Sea Trail) that meets Deep Gap Trail for a long descent into Bryson City, NC. It is warm weather hiking though, because Clingmans Dome Road is closed from December 1 through March 31, and whenever weather conditions require. The best times for wildflowers and wildlife are May and June, and of course, don’t miss the Fall extravaganza of colors that bless the Smoky Mountains in September and October. Just GET THERE EARLY! Mt. LeConte from the A.T.
Ken and I enjoyed our visit to Clingmans Dome in June so much that we planned another, this time with the friendly crew from Tennessee. We intended to explore two sites we missed last time — an old, derelict logging boiler located off the Forney Creek Trail, and a magical field of angelica, ferns and blackberries alongside the Appalachian Trail on the south face of Mt. Buckley. There were nine of us on this fine Smokies day, plenty to keep each other entertained and occupied. For the first venture, we headed down the Forney Ridge Trail toward Andrews Bald, but stopped at the junction with Forney Creek Trail. Once we had all been herded back together, we proceeded down Forney Creek. Just a few minutes later we took a right into the woods. A surprisingly easy-to-follow manway took us west through the delightful high-elevation forest, passing remnants of the old railroad bed that were easily identifiable by straight patches of grassy turf. Along the way we passed numerous artifacts including trail rail, brakes and tools, water piping, and the occasional bucket or washtub. Some may call it junk or debris, but when you consider it has been here for a century, others will call it history. After 10 minutes of tracking through the woods below Clingmans Dome, we found it. This old coal-fired boiler was abandoned by loggers in the 1920s. Not really a locomotive, this was a boiler that produced steam to operate a winch that pulled logs up and down the mountain to log-loader train cars. It is perhaps 15-18 feet in length, so not powerful by any means. While somewhat rusty, it actually has more of a mossy tint to it from decades of decay. If you peer into the firebox, you can still see the coal that spilled after the wreck. We enjoyed a snack as we traded myths about the history of logging here in the shadow of the Dome. Then, back to the Forney Ridge Trail, we next took the connector up the south shoulder of Clingmans Dome to the Appalachian Trail. We crossed Mt. Buckley, started down the south side perhaps a half mile, then plunged waist deep into a luscious field full of blossoming angelica, the thickest fern forest I’ve ever seen, and enough ripe blackberries to feed the Smoky Mountain bears for weeks. Just over a year ago, some in the Tennessee crew came to this site to plant a stand of Fraser fir saplings, a project conducted by Miss. State University. They spent an entire day mapping, planting, and tagging hundreds of the 4 inch tall specimens. They endured multiple rain showers, mud and sweat, and lots of corny jokes as they did their part to give back to the wilderness that has given so much to them. It was fun to watch and hear them call out the tree tag numbers as they excitedly discovered that almost all of their plantings have survived and are very healthy. As you will see in the new photos below, it was another great day in the Smokies; ideal hiking weather, beautiful scenery and wildflowers, stimulating exercise and conversation, and rewarding companionship. You should bring your family and friends to explore the trails around Clingmans Dome. You will find that the fresh air agrees with you.